Can China really stop 350 million people from smoking? Interesting read from NBC about China getting serious about cracking down on smoking. China is the biggest smoking country on the planet with 350 million smokers (compared to about 45 million in the U.S.). According to the World Health Organization, more than 1 million people in China die every year from smoking-related illnesses. WHO also estimates 3 million Chinese will die every year from smoking-related diseases by 2050. A high level Chinese committee announced last week that it plans to ban smoking in public places by the end of 2014. 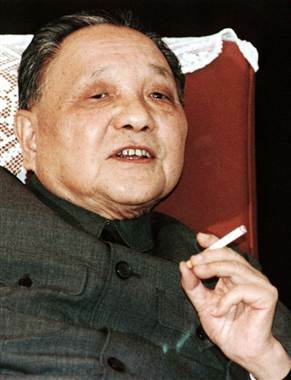 (China also recently banned public officials from smoking in public). Anyway, I’ll keep my eye on this developing story. See if China is really serious about a smoking ban. Another story on the 50-year anniversary of the Surgeon General’s, this one from Think Progress. The RawStory article touched on this, but this article deals with it more directly: Since the 1964 landmark Surgeon General’s report, more than 20 million people in the U.S. have died as a result of smoking — 2.5 million of those deaths are blamed on secondhand smoke (boy that’ll drive the Smokers’ “secondhand smoke is harmless” Club crazy.). Think about that — what a holocaust, and that’s just in the U.S. That’s more than twice the number of people killed in Hitler’s Holocaust — only it happens in slow motion, a person there, a person here. I know I watched my mom’s entire circle of friends wiped out by smoking — almost all of her friends smoked and most of them died of cigarette-caused diseases relatively young. She smoked for 60 years and managed to outlive almost all of them. 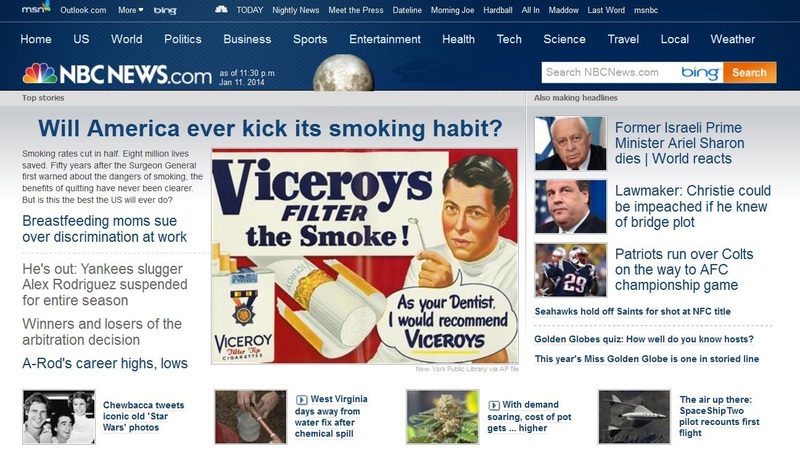 Lots of news outlets are doing 50-year anniversary stories on the Surgeon General’s landmark report. I’m posting links to a couple of them. 1) Cigarettes are more potent than they’ve ever been. …. 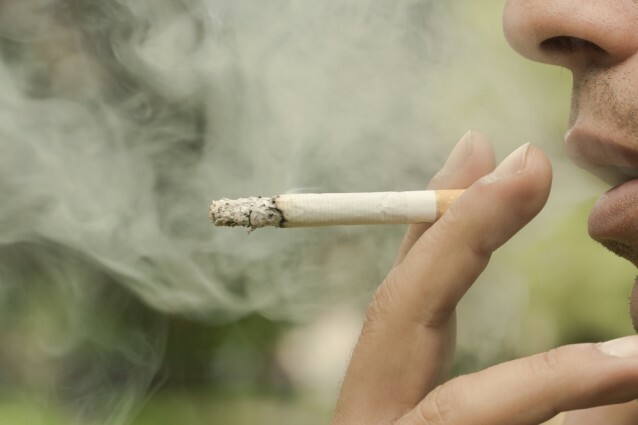 active smoking can cause a common form of blindness called age-related macular degeneration, as well as diabetes, colorectal cancer and liver cancer. 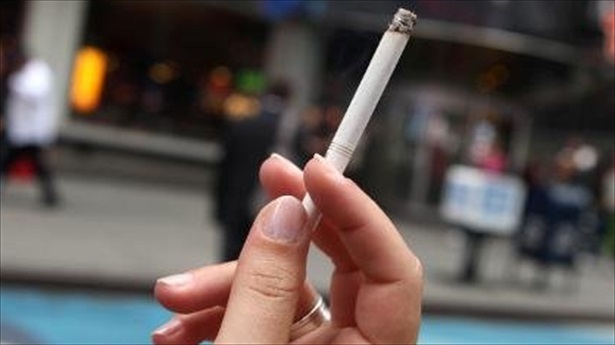 Those who do not smoke but are exposed to second-hand smoke face an increased risk of stroke, said the report. 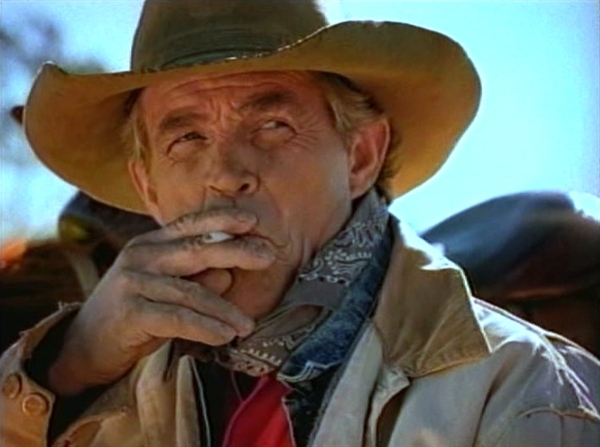 So, it’s right there in an official Surgeon General’s report: Smoking increases the risk for macular degeneration, diabetes, erectile dysfunction and arthritis (in particular, I’ve been looking into the ties between arthritis and smoking. Want to do a major post about that soon). This is important to me, because people tend to get hung up on idea that smoking causes lung cancer and that’s it. A lot of information has been coming out in the past 5 years about the connection between smoking and diabetes and arthritis. Read this book and I guarantee you’ll never watch football the same way as you did before. Mark Fainaru-Wada, who wrote about Barry Bonds’ steroids use, and Steve Fainaru, investigated the NFL longstanding cover-up and obfuscation over concussions in their sport. The result is a shocking expose of callousness and hypocrisy not only from NFL officials but from “jock sniffers” the NFL used to defend their product. The story is very similar to how the tobacco industry operated in the 1950s. The tobacco industry enlisted the help of a few scientists, several of whom were literally bought off, to create “junk science” to raise doubts that cigarette smoking was causing lung cancer. The industry did this well into the 1970s. The NFL did almost the same thing. The league started up a committee, led by someone with zero experience or background in neurology, and reached a number of ridiculous conclusions that there was no risk of brain damage from playing NFL football — all while the league was quietly paying out thousands of dollars every year in disability payments to former players who had become brain damage from playing football. Instead of taking the problem seriously and working to try to prevent brain damage, the NFL instead took the tack of trying to sweep the evidence under the carpet — and smearing and attacking the researchers and scientists digging up evidence that football was destroying men’s brains. The book reads like a detective novel, as researchers try to get to the bottom of what’s causing a number of former players to behave erratically years after they retired. The book details the huge, and at times petty, fights between different researchers determined to get their hands on former players’ brains after they die so they could take credit for furthering the research into brain damage. 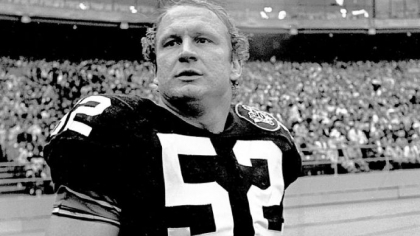 The book focuses at length on the heartbreaking story of Mike Webster, a Hall of Fame centre who played on the Pittsburgh Steelers’ Super Bowl teams of the 1970s. After he retired, Webster — always a friendly, engaging guy — started acting strangely. He became a drifter, sleeping in bus stations, bunking at his son’s apartment. He became moody and had terrible tantrums. He would vanish periodically, he abandoned his family, etc. At times, he was lucid, and knew full well that something was wrong with him, other times he was lost, sometimes in a rage in which he would write long rambling letters attacking people with the Pittsburgh Steelers organisation. It was a very, long slow and painful journey into madness and despair and “League of Denial” pulls no punches detailing his harrowing descent. Finally, Webster died at the age of 50 in 2002. The book shows how big ideas often start small. Knowing that Webster had suffered from erratic behaviour and mental illness, an assistant coroner in Pittsburgh — an immigrant from Nigeria named Bennet Omalu — did some tests on Webster’s brain and found damage similar to what was seen in boxers or people with Alzheimer’s. 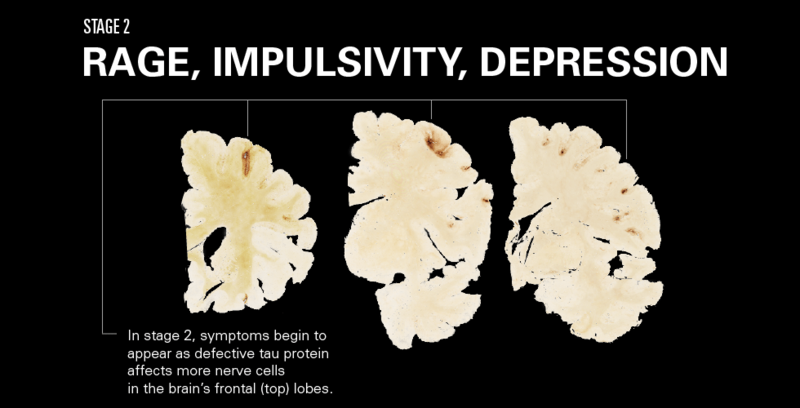 Omalu concluded that football caused this brain damage, the name given to it was Chronic traumatic encephalopathy (CTE). Omalu became a central and controversial figure over the next decade as he blazed the trail into research of football and brain damage. 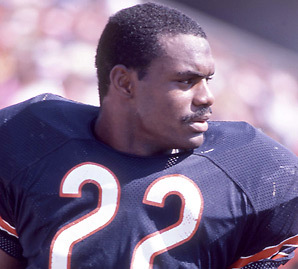 He originally found the damage in Webster’s brain and his work led to a lot of the knowledge we have today about the brain damage caused by football, but his contributions were quickly overrun by forces out of his control — namely the NFL, which had a multi-billion dollar industry to protect. The NFL around this time formed its concussion committee, and Fainaru-Wada and Fainaru explain in detail how, primarily by packing the committee full of “jock sniffers,” the NFL simply used this committee as a public relations tool to try and downplay the dangers of playing football. It was nearly 50 years after the tobacco industry established its “Council for Tobacco Research” to obfuscate and confuse the science around cigarettes, and the NFL stole heavily from the tobacco industry’s playbook. Fainaru-Wade and Fainaru make several references throughout “League of Denial” to the remarkable correlations between the NFL committee and the long-defunct and discredited tobacco industry front group. The NFL simply did not learn from the example of the tobacco industry that attempting to create fake science to cover up the real science will not work, especially in the long term. The football helmet industry also got involved, falsely promoting new helmet designs as “concussion proof.” The science behind what few studies had been done on these helmets turned out to be every bit as bad and half-baked as what the NFL concussion’s committee was putting forth. Meanwhile, NFL players continued getting concussions and continued being put back in gamea while still suffering from the effects of their concussions — putting them at risk for even further brain injury. The billion-dollar NFL money-making machine just kept churning … as it became pretty obvious that the league’s concussion committee was all part of protecting that machine. 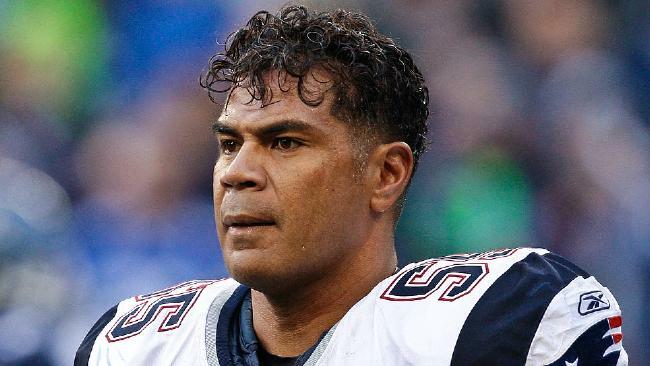 After Mike Webster’s death, there were a number of other high profile deaths by formers players — notably Dave Duerson and Junior Seau, both of whom committed suicide — and notably committed suicide by shooting themselves in the chest, because they both knew something was wrong with their brains and they wanted their brains studied after they died. What the Dissenters found was that in case after case, a number of deceased NFL players had varying levels of CTE. (CTE explained). Some researchers wondered if perhaps every single player in the NFL had this condition from the repeated pounding of the game. Even amongst the Dissenters, there were a number of battles and wars as researchers in this area literally scrambled in a disturbing race to gain possession of former NFL players’ brains after they died. Suddenly, players’ brains became a hot commodity. 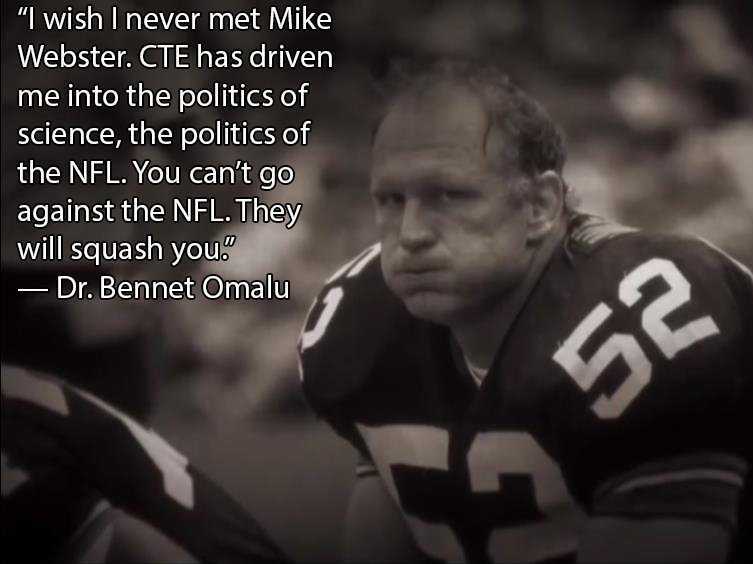 To a degree, and “League of Denial” is fairly sympathetic to Omalu, but none of the scientists involved, Omalu included, were really completely innocent in this unseemly battle over players’ brains. In the end, these battles proved to be a sideshow, as the real story began when former players, many of whom had been struggling for years with depression, memory loss and Alzheimer’s, began banding together to sue the NFL. In the end, the NFL disbanded its discredited committee, very much like the tobacco industry disbanded the Council for Tobacco Studies. The NFL imposed a number of new controversial rules trying to ban late hits and helmet to helmet contact. Several thousand former players sued the league, winning a $765 million settlement against the league. Many people exclaimed that the NFL got off ridiculously easy with this settlement. A judge recently threw that settlement out as inadequate. The NFL will likely have to pay former players considerably more than $1 billion to settle the litigation. 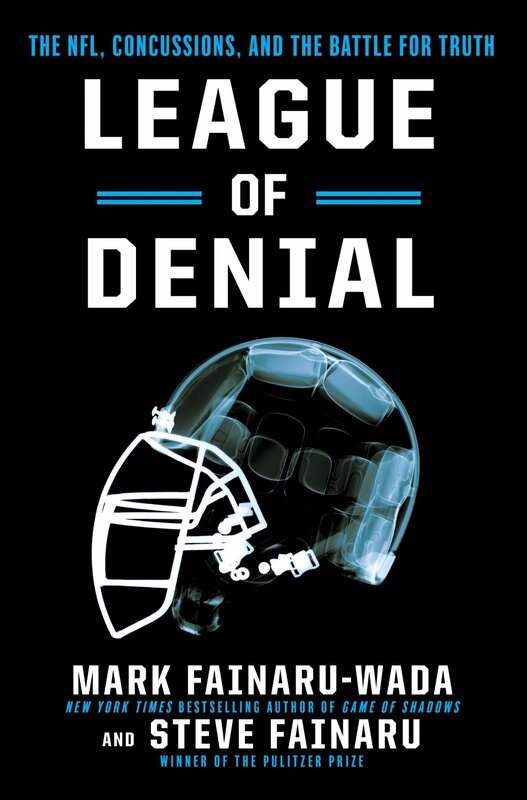 League of Denial is definitely an engaging and fascinating read, and after you’ve read it, you’ll never watch football in quite the same way. I don’t have the answers myself. Some people have speculated that the concussion litigation could bring the NFL down. The NFL is an awfully huge entertainment industry, and won’t go away easily. It’s too exciting and too popular. I don’t buy the argument that the players knew what they were in for. They chose to play football. No, they didn’t chose to suffer from dementia and early onset Alzheimer’s and clinical depression in their 40s … and remember most football players don’t play for long — 5 years or less, and most football players really didn’t make that much money in the 70s and 80s. They didn’t choose to be lied to about how much damage was being done to their brains. They’ll never totally get rid of the concussions; the game is too violent and the players too big and fast (I suspect the rise of concussions has something to do with the rise of PEDs in sports). What the NFL needs to do is start taking the concussions seriously. Stop putting guys in games when they are obviously hurt, start taking the science seriously, ban hits to the head. Maybe a billion dollar settlement will be enough to wake up the NFL. Who knows? Interesting and to me surprising story. This week, several tobacco companies — RJ Reynolds, Altria (Philip Morris) — agreed with the Justice Department to print “corrective statements” in major newspapers around the U.S. admitting that they lied for many years about the health effects of smoking. These full-page ads will appear in the Sunday editions of 35 newspapers. In addition, the tobacco companies have to post articles on the newspapers’ websites and on their own websites admitting their lies. On top of that, there will be television commercials as well. This agreement is part of a 15-year-long racketeering case being pursued by the Justice Department against the tobacco industry. The five corrective statements will address the companies’ deceptions regarding 1) the health effects of smoking; 2) the addictiveness of smoking and nicotine; 3) the false advertising of low-tar and light cigarettes as less harmful than regular cigarettes; 4) the designing of cigarettes to enhance the delivery of nicotine; and 5) the health effects of secondhand smoke. Oh, No. 5 is a hoot. Reminds me all the old arguments I’ve had with smokers’ right’s nuts that secondhand smoke is completely harmless. Dave Hitt, FORCES, the Heartland Institute will not be happy with these full-page ads. I mean does this make any difference? It won’t undo the damage done and bring people back to life. But, I think it’s important that these lies are exposed once and for all (and I’m serious, there are still people to this day arguing that secondhand smoke is harmless). It’s all about maintaining the legacy of the “cigarette century,” a century in which untold millions died from their tobacco addiction, and the industry’s cover-up of that holocaust. Ultimately, that’s how we will win. As you may have noticed, it’s a brand new Party Lounge. 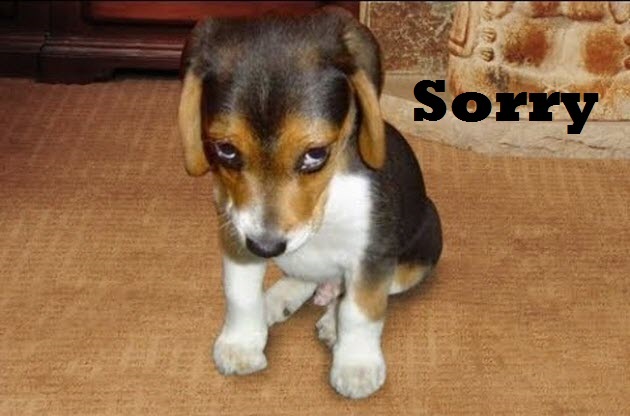 Had issues with WordPress.com over links I had posted to commercial sites. The biggest issue I had was the lack of communication and response from them — and that’s not the first time we have had issues with lack of response and communication from WordPress. So far I have been impressed with the communication here with my new hosts. So, the Lounge looks a little different, but all the old content was saved. 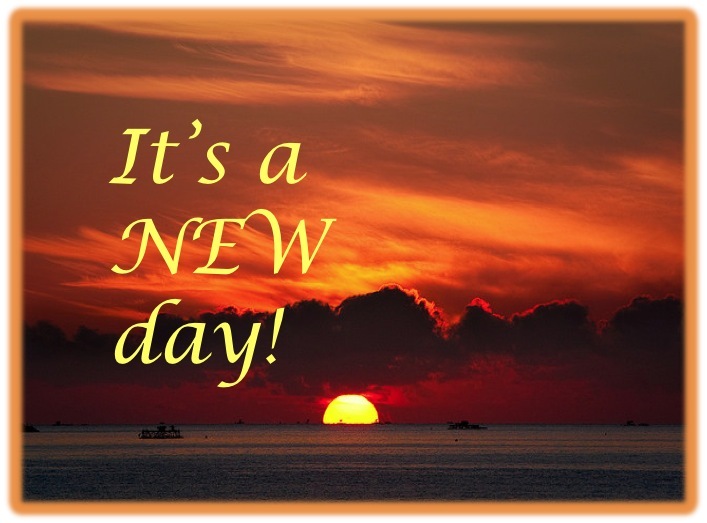 You might see the site go through some changes as we experiment with different themes to make it look nice. Thanks for your patience.